Android Push Notification is a very important and essential feature. Even you’ll find it in every 8 out of 10 Android application. As per google’s documentation “Google Cloud Messaging for Android (GCM) is a service that helps developers send data from servers to their Android applications on Android devices”. 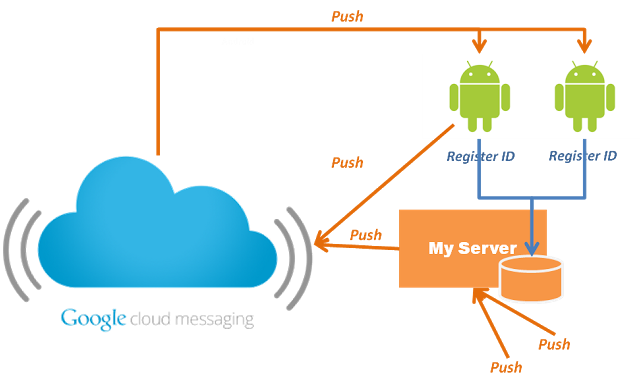 GCM is a service provided by Google for developer that helps developer to send data from server to any number of Android devices. It’s a free service means any developer can send any number of notifications using GCM in a day for any number of Android devices. GCM can be used as a notification engine. It means on an event it can send a notification to an android device. A notification can be just a string message or some sort of data. Using GCM, maximum 4kb of payload can be sent in a notification. Google provides GCM as a free to use service. And there is no limit on number of messages per day either. Android App can receive the message from Google cloud messaging server (GCM) even if the app is not running via Intent broadcasting. First we will implement a web application which runs on a web server. Here after we’ll refer to this as GCM server application. Second we will implement functionality in our android app to receive and process Notifications from GCM server. And for this we’ll refer it as GCM client application. Create Google Project: Go to the URL https://cloud.google.com/console/project then create a project and navigate into it. Enable Google Cloud Messaging For Android: Go to menu “APIs & auth –> APIs” and switch on. Create Server Key: Go to Menu “Credentials” and under the section Public API access, click Create New Key. There are different types of keys and here we should use “Sever Key”. Edit Allowed IPs: This is to white-list a set of IP addresses as the server key is tied to IP addresses for security. To get your public IP address, in Google search type ‘my public ip address’. Click ‘Edit allowed IPs’ and update your IP. After obtaining the Server Key from Google developer console our only work to implement GCM Server is develop a web application. For simplicity here i saved gcm reg id in a text file and i’ll use this text file to read gcm reg id during sending a message to that android device. Actually reg id uniquely identifies an android device from another. I used several Google Helper libraries. And here is Servlet code to send notifications to Android devices. Usually an android application with GCM implemented do the following tasks. Register with GCM Server and receive reg id. Share the reg id with application server. Receive and process Push notifications from application server. Google Project Id – You will get it from Google developer consoler in project’s screen. If our application/android env doesn’t meet any of the above conditions then when we try to test our GCM implementation then it doesn’t produce any error but you’ll not get any notifications from server as well. Just put below code in your project’s activity code which you use for registration purpose or you can put it in anywhere in a activity. These lines does nothing just on invoking they communicate with Google and then in return they give you reg id. And this reg id is used in sending notifications from application server to device. Log.d("RegisterActivity", "registerInBackground - regId: "
Next we’ll need to implement a BroadcastReceiver and a Service to notify an user about notification and receive notifications from application server. Please give special attention while you modify your manifest file because event after implemented everything exactly right but a minor mistake in manifest file during adding those implemented components to it can lead to unwanted conditions. That’s all we have to do to implement Android Push notifications. Hey can we also send data from server to Mobile devices like we does using GCM?